The Aboriginal Drug and Alcohol Council (SA) Inc. with Funding from Drinkwise Australia is proud to present the Alcohol Guidelines to Reduce The Lifetime Health Risks From Drinking Alcohol. 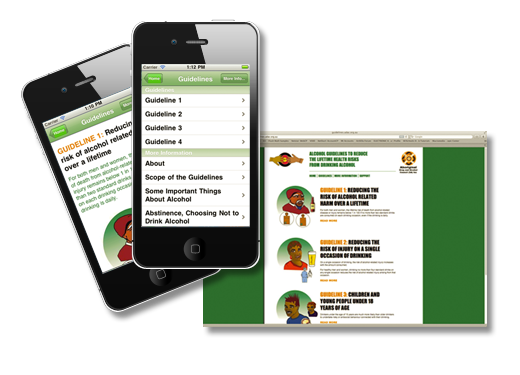 In an effort to maximise the distribution of the guidelines, ADAC has created the Alcohol Guidelines mobile friendly website, commonly referred to as a Web App, this means that the guidelines can be used as a reference on your home computer, tablet PC or Smart phone with ease. This mini website is to promote the use of the guidelines in all of it's forms, as a printed resource, a downloadable PDF file and the web app format website version. 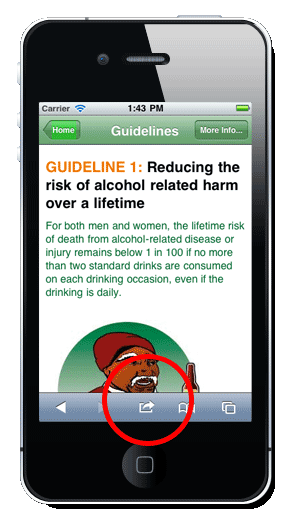 The online edition of the Alcohol Guidelines have been developed as a Mobile Web Application, this means you can view the guidelines on your smartphone or tablet PC and they'll be easy to read, bookmark and access. 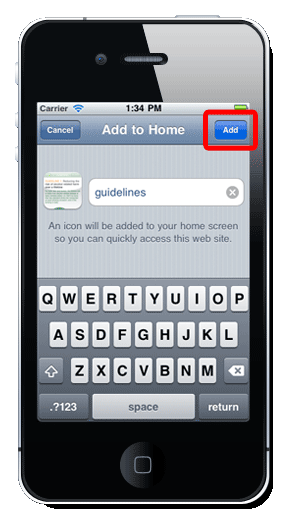 If you have an iPhone you can follow the steps below to create an App Icon on your home screen, so you can access the guidelines with the press of a button. Click the Bookmark button at the base of the browser. Name the Icon and click the Add button. 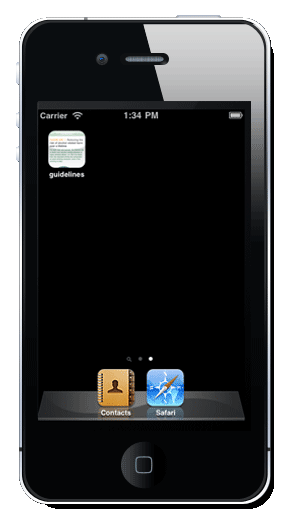 The Icon will appear on your phone screen, you can now access the Guidelines when ever you need. 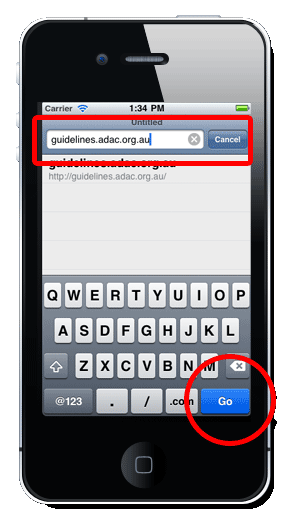 Please note that the mobile Web App version of the Guidelines is suitable for use on both iOS Devices (such as the iPad and iPhone) along with Android Devices.Simply use the provided web browser on your phone or tablet to access. To improve the spread and access of the Guidelines we have made the material available in print form, digital download (PDF) and as the Web App format. In this page you can use the button to the left to download a PDF copy of the guidelines or the form provided to request a physical copy to be sent to you. The Guidelines are free and may be redisributed as a whole item (please ensure that you provide adequate recognition for ADAC and Drinkwise. 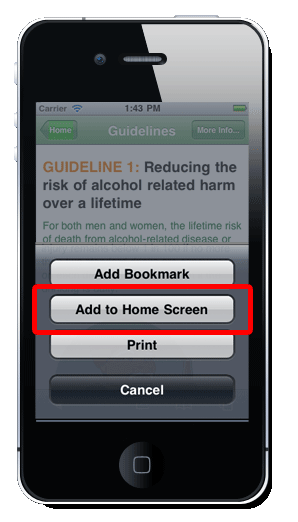 The purpose of distributing the guidelines was to ensure responsible drink through education, please show your support for safer drinking practices by linking to the web version of the guidelines on your website, blog or a relevant forum. Additionally to using these web buttons where you can, we'd appreciate any efforts you can make to share the guidelines link on any social media you use. ADAC provides responses to a range of state and national committees and strategies, helps communities deal with the problems associated with substance misuse, develops health promotional materials, undertakes research on its own and in collaboration with various universities and key national research organisations. DrinkWise Australia is an independent, not-for-profit organisation focused on promoting change towards a healthier and safer drinking culture in Australia. Our activities aim to affect generational change in the way all Australians consume alcohol. We also aim to increase the age that young Australians are first introduced to alcohol, as the evidence emerges of the impact that alcohol has on a developing adolescent brain.